The reputation of Tommy MacDonald, the husband of Howmore warden Betty, went before him. A cyclist who was making a long-distance trip down the Western Isles was keen to have his assistance and to meet him, but it was not to be. 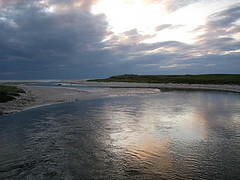 The account of the journey is to be found on the blog – Outer Hebrides Trip Day 9 – and gives insights into the mind of a seasoned traveller on a bike and with images such as this one of the beach within yards of the hostel. Take the opportunity to join his excursion through fascinating countryside, weather and places to stay. Next → Next post: Go Off-Grid?